Island - The Chip's Challenge Wiki - The Chip's Challenge Database that anyone can edit! Island is the 189th level in Chip's Challenge 2. It was created by Joshua Bone. This level is only solvable under the CC2 ruleset, as a teeth monster will attempt to move towards Chip's actual position, even if Chip is in mid-move. In MS, there is no "mid-move" timing, and in Lynx, the teeth will use the destination tile. 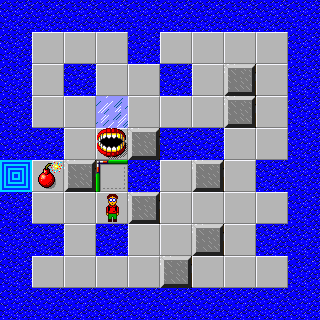 This allows a teeth monster that is 1 tile away diagonally to be lured horizontally.